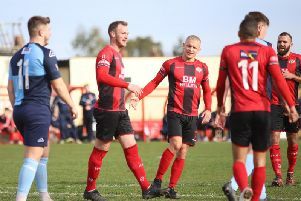 It’s becoming a bit of a numbers game for Kettering Town after they tightened their grip on top spot in the Evo-Stik League South Premier Division Central. A first-half header from captain Michael Richens earned the Poppies a 1-0 success at Rushall Olympic - their fourth league win in a row. The latest victory saw them move five points clear at the summit after second-placed Stourbridge were held to a 1-1 draw by Tamworth. Kettering’s victory at Rushall was their eighth win in nine away league matches as they maintained their unbeaten record on the road. They have conceded just twice in those nine away matches and have only shipped eight goals in total in their 14 league games so far while their latest success brought with it an eighth clean sheet of the season. It’s been a magnificent start for Marcus Law’s team and he insists their defensive record is the most pleasing thing after it was an area that held them back in the previous campaign. “Our away record is very good, which is pleasing,” the Poppies boss said. “But the goals against column is probably the most satisfying thing so far. “As managers and coaches, you identify situations and you try to bring in the right personnel to improve those areas. “But it ultimately comes down to the players and this squad, as a whole, has improved us and we are pleased to be where we are at the moment. “We are already having a better second batch of 10 games than we did last season and we just want to keep that going. “I am certainly not getting overly carried away and the pleasing thing is there isn’t a hint of complacency within the squad. As far the clash at Rushall was concerned, Law felt his team showed “resolve, grit and determination” to get the job done. Goalkeeper Paul White had to make a fine late save to preserve the points and Law added: “Rushall set their stall out, they conceded a lot territory and possession in the first 70 minutes and then they had a right go at us. The Poppies are back on home territory on Tuesday night when they entertain Redditch United at Latimer Park.